Summer in the Alps… really?! Lovely weather: Imagine a really good British summer… for the whole summer! 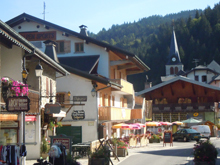 Stunning scenery: Les Gets is a small, picturesque town, nestled between mountains just over an hour away from Geneva. A hidden gem: Alpine ski resorts aren’t as popular in the summer months, so there aren’t the crowds which appear in winter – the town feels really laid back, and there’s plenty of opportunity to relax if you want a little peace and quiet, or to sign up to some activities. 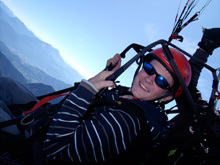 There are SO many activities on offer: Within easy reach there’s canyoning, whitewater rafting, canoeing, hydrospeeding, mountain biking, walking, swimming (pool and lake), paragliding, horse riding, via ferrata, rock climbing and wakeboarding at lake Geneva (45mins away). There are also tennis courts and a volleyball court in Les Gets plus an adventure park – a course to challenge children and adults as you swing through the trees on ropes, ladders and with leaps of faith! Great for younger children too: Go to the playground on the “Petit Train” or let it take you on one of its discovery outings, swim in Les Gets lake and make a splash with the slide or go to Morzine swimming pool. Play on the giant wooden boardgames that are put up in the town square every Tuesday, or have your hair and face painted and styled and have a go at wood cutting with real jigsaws (5 years plus). 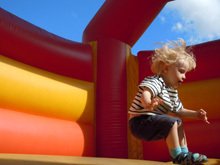 There are trampolines, bouncy castles, a carousel and of course the bubble lifts… all on our doorstep. Let us take the strain: We can book all your activities – just put your feet up and unwind, then feast on a delicious 3-course evening meal prepared for you by Jim! Grass skiing… the new cool?